The Guajillo Chili is the most popular chili in Mexico beside the Poblanos. 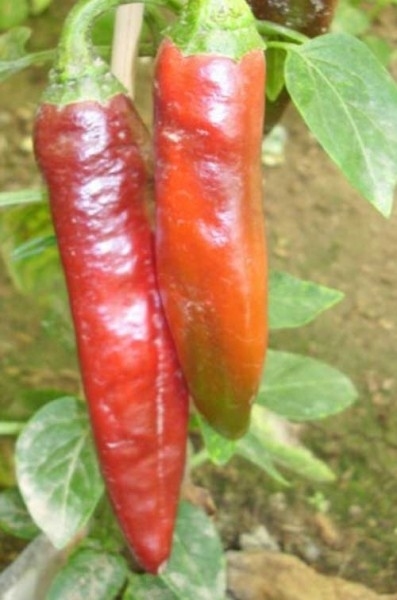 The peppers are usually between 10 and 15 cm long and are harvested and used both in green and in red. They have a moderate heat of 2,500 to 4,000 Scoville units and a deep red colour when fully ripened without losing it after the drying process. The Guajillo Chili obtained its popularity because of its extraordinary taste: a fruity green tea flavour with berry overtones along with tannic and pine hints. They are traditionally used for making pastes and sauces as well as for seasoning stews and meat dishes, or they can be used for dyeing purposes.